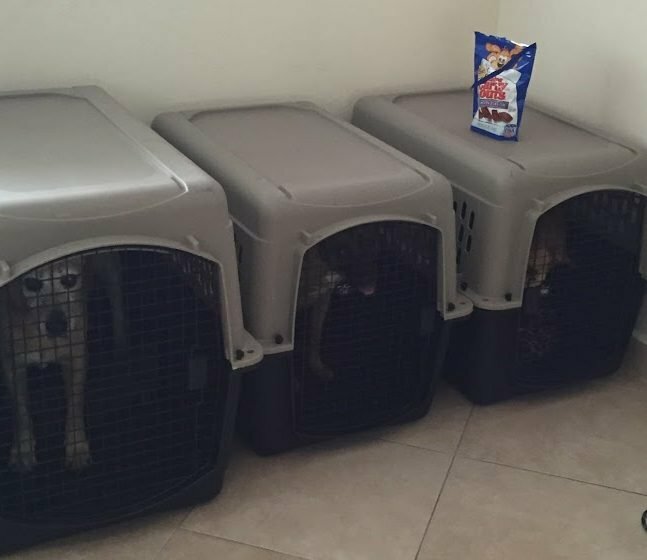 A few weeks ago, I did a post on boarding your dogs while you go on vacation. But what if you need to travel WITH your larger dog and fly them in cargo? Whether going on an extended vacation, or moving to a new place, sometimes they need to fly. 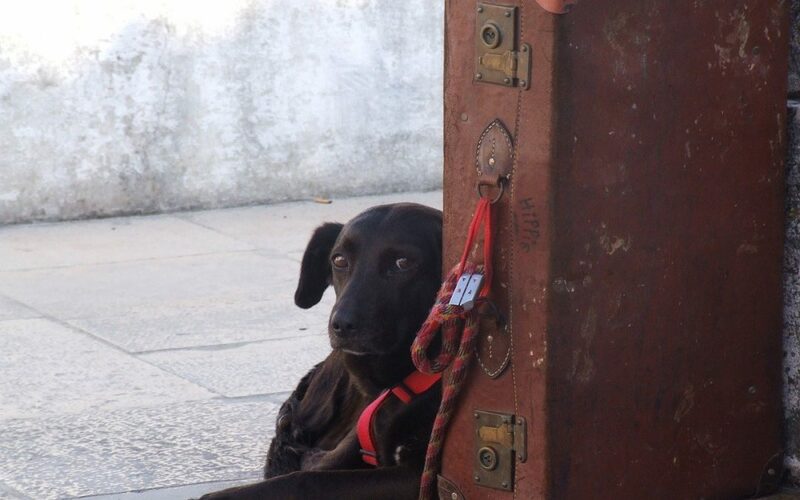 These tips for flying a dog in cargo will help ease your worries! When we moved from Puerto Rico to Alaska, we were pretty limited on airlines that accept dogs in cargo. There were a few options to pick from, but most don’t have air conditioned cargo holds, where larger dogs have to go. Planes without air conditioned cargo holds mean they can’t transport live animals on flights where the air temperature either at the departure or arrival airports can’t be above 85 degrees. Well, living in the Caribbean meant it was often hotter than that. We couldn’t risk flight cancellations for the babies, as we were on a fairly tight schedule. 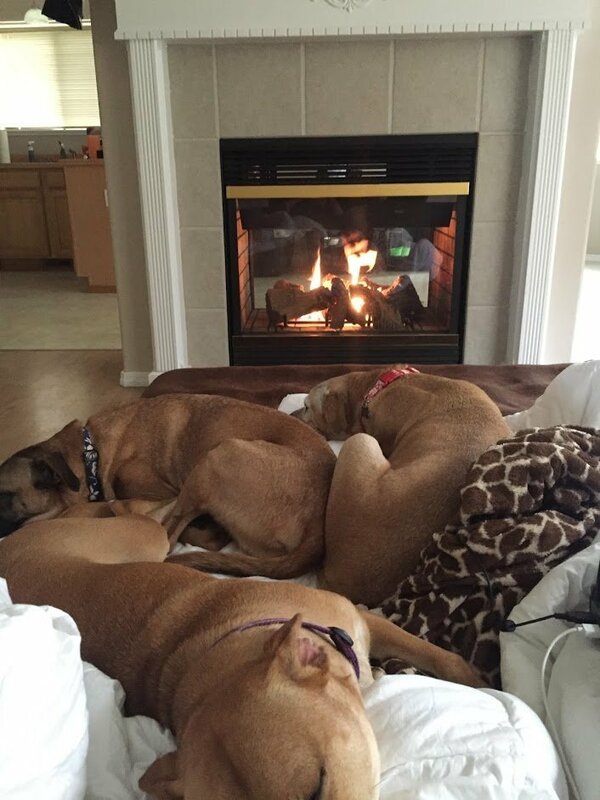 In the end, we were limited to United Petsafe, and they did a great job with our babies. They even kept me updated on the pups’ status when I reached to them out on social media. Luckily, many places have more options. Alaska Airlines has great feedback on flights, and they’re fairly affordable too! I suggest booking as far in advance as possible to ensure you get a spot on the plane for your pet. There are often limits to how many animals can be transported. Booking as soon as you know your travel dates will help make sure you get the dates you need. If it’s a very long flight, confirm with the airline if an overnight stay is needed. With our move, our pack had to spend a night at the airport boarding facility in Chicago. Important: If your dog does have an overnight stay, check to see if there are any holidays during those dates! We’d booked their flight months in advance. A week before their trip, I got a call from United that they didn’t realize the airport boarding was closed for Memorial Day, which was the day the pups were supposed to be there. On top of that, they didn’t have any spots on the flight the day before, and we were flying out the day after them. We had to pick a new date a few days before we expected, and scramble to get all 3 dogs into the vet for the pre-flight health check (more on that later). It all worked out, but I was one stressed dog mom for sure! What Should I Do Before My Dog Travels in Freight? I recommend purchasing a travel appropriate crate as soon as you can. We kept ours in the living room and would occasionally drop treats inside to get them acclimated to it. It wasn’t Ginger’s first trip (we brought her to PR with us) but she was definitely the most worried as she’s never been a fan of small spaces. If your pup knows it’s a safe spot, it’ll make the flight easier. You definitely want to take accurate measurements of your dog and verify with the airlines on crate measurements. Rico is our tall dude and even though he was only 45lb, he was a couple inches taller than our 70lb Ginger was. They wanted us to put him in the larger crate. Luckily, because he was just at the height limit, they let it slide, which was good because he was settled in, anxious, and refused to leave his crate! You also want to confirm flight requirements right away. 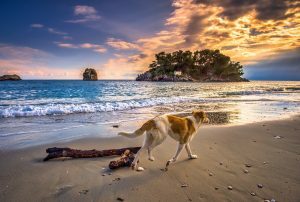 Most require a health certificate from your vet dated within 10 days of travel. There are also some breed restrictions due to potential breathing problems, so be aware of that. The airline had us put bottles with water inside, which were basically hamster bottles…good luck getting my not-so-intelligent pups to use that! We used containers similar to the ones above. We put them underneath the water nozzle to catch the drips, and froze water in one so it would start to melt after they were inside and they could lick the ice water up. The other was left empty for the airlines to put food in. We did a trial run with the bottle/container and it worked great! Military Families – You Gotta Read This! SPCA International’s Operation Military Pets is a fantastic resource in aiding military families keep their pets when facing a PCS to/from overseas. They help by providing financial assistance for pet relocation costs. Trust me, I know how expensive it can be moving your pets. 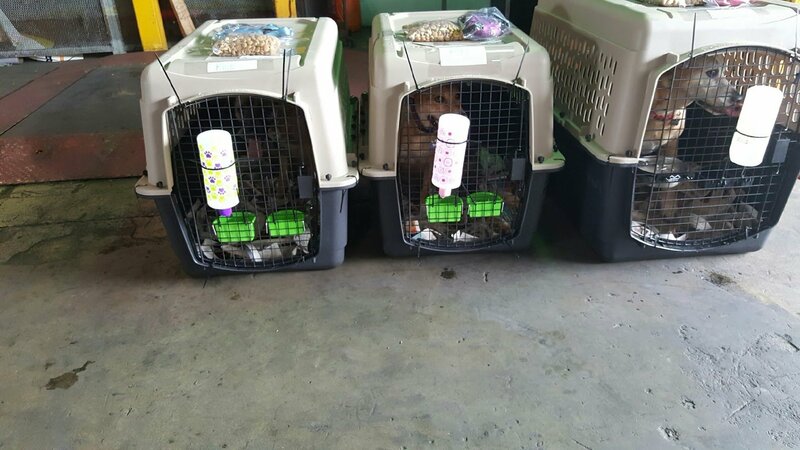 Three large dogs flying from Puerto Rico to Alaska was not cheap! They’re so worth it, but UGH it was spendy! You can apply for financial assistance grants within 3 months of travel, but it does take awhile for acceptance notifications if you’re selected. 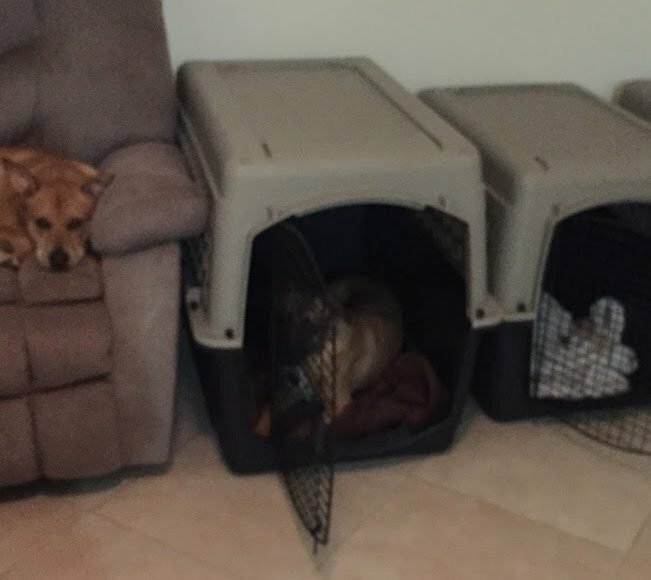 By the time the day of travel came, Roxy & Rico were more comfortable with their travel crates, and when it was time to drop them off at the airport, they went right in without hesitation. Ginge took a little prodding, but she did great! Try not to stress, because that can cause them to feel anxious as well. Giving drugs to your pet isn’t recommended, as that can cause issues with breathing. I swiped some lavender oil on their kennels to help relax them a bit. Check with the airline on a recommended feeding schedule. Ours didn’t want them to have food within 4 hours of the flight in case they had tummy issues. They had us pack ziploc bags of food and they taped it to the top of the kennel, along with their leash and collar. We signed paperwork, said a quick goodbye and see you soon, and they were off on their biggest adventure! Confirm when and where your pup is supposed to be picked up. It’s generally the cargo area of the airport and could be a few miles away from the passenger terminal. When you go to open their crate, make sure you have an extra person available to help get them leashed up so they don’t run off out of fear. Flying is stressful! If your travel schedule doesn’t allow for you to pick your dog up, a local boarding kennel may be able to help. Due to the last minute date change, we were no longer arriving the same day as our pups. I was able to find an amazing kennel in Anchorage that was able to bring their van to the airport at 9:30pm to pick them up and keep them for a few days until we arrived. They were nice enough to post pictures like the one below on Facebook for me, which you know I greatly appreciated! The day we picked up the babies was the best day, as our family was together! 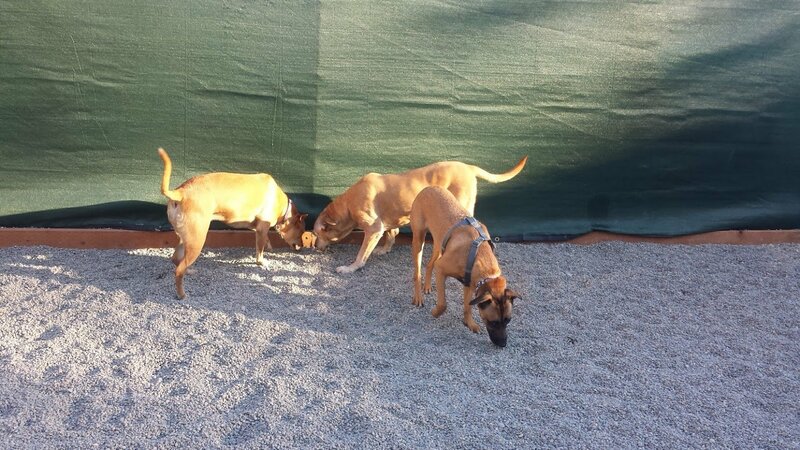 We were lucky and had arranged our rental house and were able to walk the backyard to check for possible escape routes before picking up the pups. We also tried to keep their world small for a few days and didn’t take them on car adventures until they knew we weren’t dropping them off at a scary airport again. If we’d realized how great CBD oil would be for Rico, we definitely would’ve used that! Read up on the benefits of CBD oil here. I’m pretty sure we spent the entire next day in our new house in a giant puppy pile! Give your pet lots of love and reassurance and they’ll adapt just fine! Have you ever had to fly your dog? How did they do? Share below!